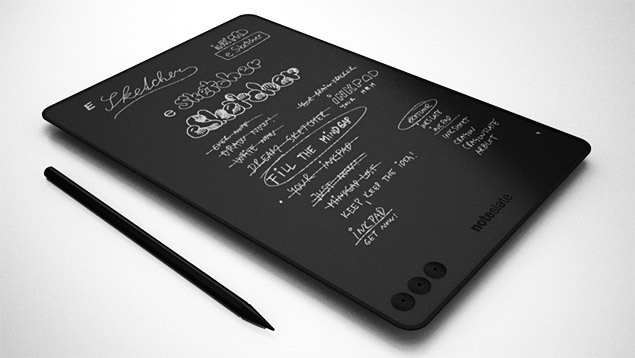 Meet Note Slate, it’s no iPad 2. It’s a tablet with stylus and black and white display, just like the 90’s Apple Newton. It might not bring you back to the iPad future, but definitely bring you back to the 90’s. The Note Slate tablet has no email, no web browser, no games, no Maps, no videos, no Garageband or iMovie. It is just a big drawing pad aiming to recreate pencil and paper. It does have a stylus you can draw with, the other end of the stylus serves as an eraser. Note Slate comes with only one-color E-ink (red, green, blue, or black), just like one color pen + paper. At least its maker owns up to it. : “Real size display in 1-bit ancient interface.” There is no anti-aliasing in the pixel based display, where 1mm = 4 pixels. iPad 2 with high quality IPS display is still manages to be slightly thinner. 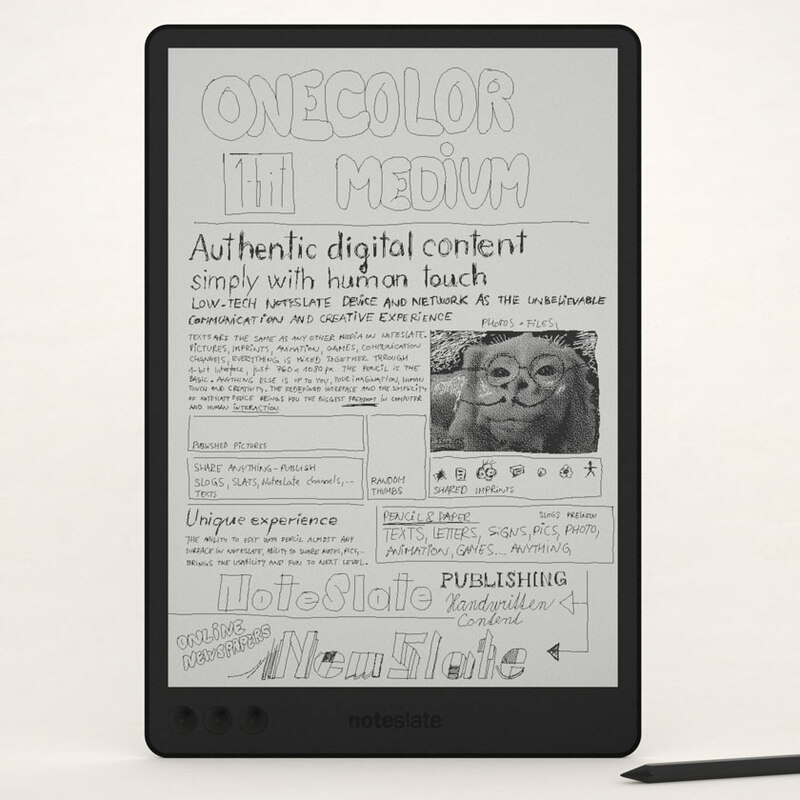 The Note Slate 1 color e-ink display is larger though, at 190mm x 270mm, larger than iPad’s EXTERIOR dimension of 185mm x 241mm. Note Slate has 3 physical dedicated buttons are: Save, Show, and Delete. Don’t press the delete by mistake! Irony: “Authentic digital content simply with human touch.” Obviously they didn’t realize a stylus isn’t “human touch.” A finger is human touch. You can save $400 on the price of iPad 2 and get this $99 “tablet.” (WiFi version costs more). But you can also get pencil and paper for a few dollars to do the same thing. This entry was posted on Thursday, May 5th, 2011 at 3:10 pm	and is filed under iPad. You can follow any responses to this entry through the RSS 2.0 feed. Yeah, but how many chalk boards let you save your notes to a CF card? And how many chalkboards have a built in mp3 player? I’d argue that a stylus adds more of a human touch than an actual finger. Who finger paints anything these days anyways? Maybe you haven’t heard of this thing called email and multitouch. It’s quite nice, some might say. To OP Editor: This is not an iPad and it doesn’t try to be one either. I think this product is really cool and I will definitely get one they start to sell it and if it has a good eBook reader. It seems like you have totally missed the point of this device. The product uses “Human Touch” in its advertising when it’s a stylus based product.